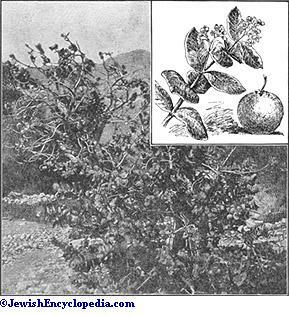 A fruit described by Josephus ("B. J." iv. 8, § 4) and Tacitus ("Hist." v. 6) as growing near the site of Sodom, "externally of fair appearance, but turning to smoke and ashes when plucked with the hands." It has been identified by Seetzen, Irby, Mangles, and others (see especially Robinson, "Biblical Researches in Palestine," ii. 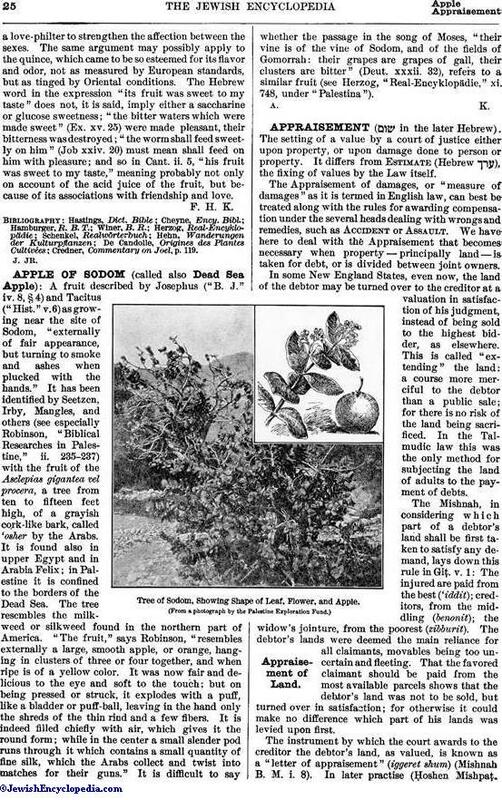 235-237) with the fruit of the Asclepias gigantea vel procera, a tree from ten to fifteen feet high, of a grayish cork-like bark, called 'osher by the Arabs. It is found also in upper Egypt and in Arabia Felix; in Palestine it is confined to the borders of the Dead Sea. The tree resembles the milkweed or silkweed found in the northern part of America. "The fruit," says Robinson, "resembles externally a large, smooth apple, or orange, hanging in clusters of three or four together, and when ripe is of a yellow color. It was now fair and delicious to the eye and soft to the touch; but on being pressed or struck, it explodes with a puff, like a bladder or puff-ball, leaving in the hand only the shreds of the thin rind and a few fibers. It is indeed filled chiefly with air, which gives it the round form; while in the center a small slender pod runs through it which contains a small quantity of fine silk, which the Arabs collect and twist into matches for their guns." It is difficult to say whether the passage in the song of Moses, "their vine is of the vine of Sodom, and of the fields of Gomorrah: their grapes are grapes of gall, their clusters are bitter" (Deut. xxxii. 32), refers to a similar fruit (see Herzog, "Real-Encyklopädie," xi. 748, under "Palestina"). Tree of Sodom, Showing Shape of Leaf, Flower, and Apple. (From a photograph by the Palestine Exploration Fund.)A. K.